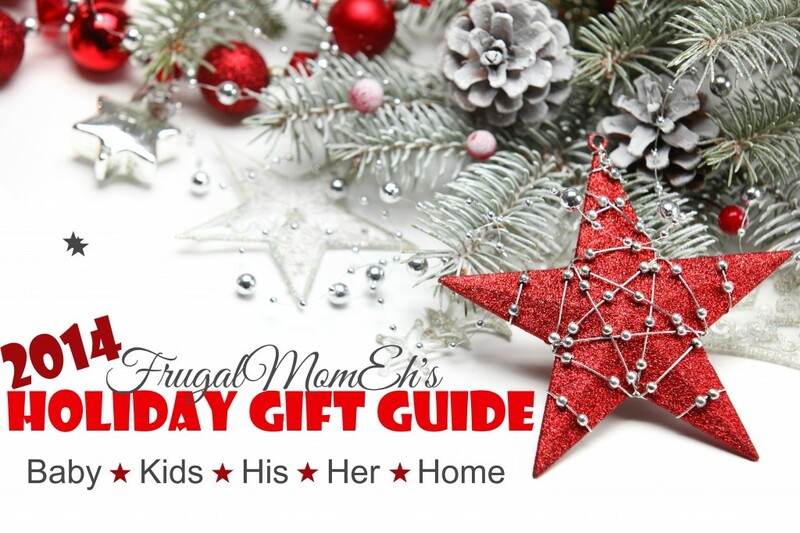 Our Generation Dolls & Accessories #FMEGifts14 - Frugal Mom Eh! I’ve been (not so) patiently waiting for Keira to be old enough to play with proper dolls. I won’t lie, I love the idea of all the little outfits and accessories, not to mention the gorgeous dolls themselves. Well she is finally old enough now so I have to say I am pretty thrilled to present the Our Generation Dolls, fashion and accessories. 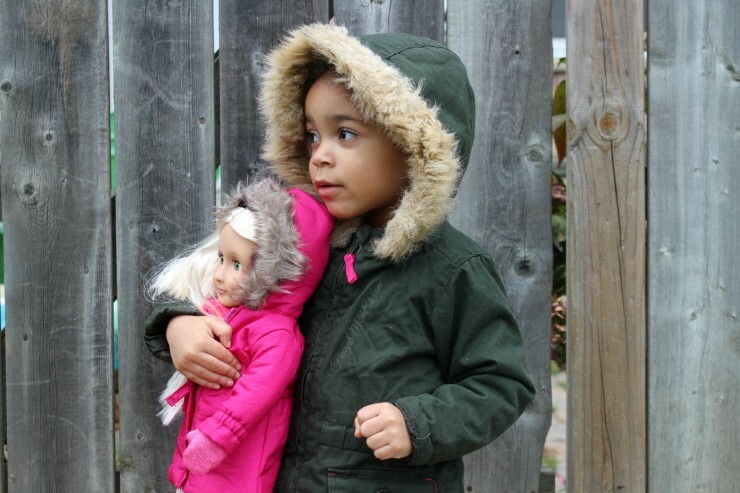 The Our Generation collection feature 18″ dolls, stylish and detailed fashion and accessories all at an incredible value. 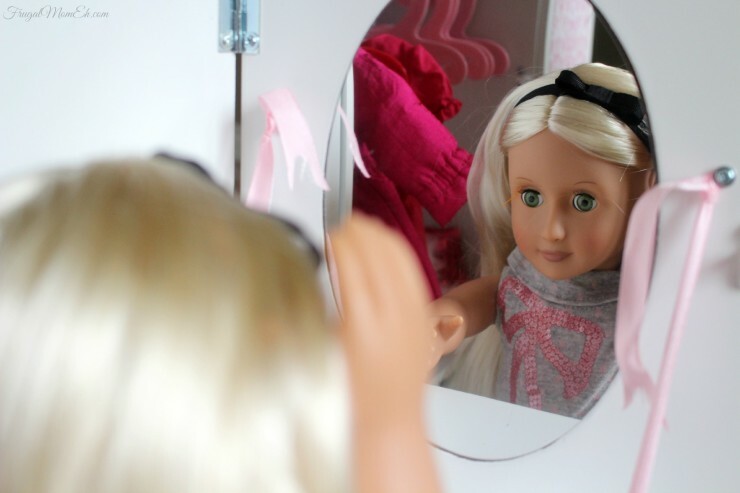 I love the Our Generation dolls have been made so affordable, it makes having a beautiful doll accessible to so many more little girls than some of the other 18″ dolls with higher price points. I think the lower price point also makes these dolls more reasonable for the younger age range who may just play with their doll just a little big rougher. What I love too is that despite the much lower price point, the quality of these dolls and accessories does not disappoint. The Our Generation doll we were sent was Holly, along with two fashions -Hearts to You and Turn on the Brrrights plus an amazing Wooden Wardrobe. Holly is a gorgeous doll with pretty blonde hair and green eyes and comes with a pink frilly dress with an animal print bow, a pair of black tights, a headband and adorable furry boots with pom poms. Her eyes close and she is also poseable. The box she came in was made from recycled materials and can be turned inside out to form a pretty gift box around her. How smart is that? The packaging for the Our Generation Dolls is actually full of surprises including inspiring stories of real girls such as that of Maddy, Kelsey and Sierra who started The Pink Polka Dots Guild and have raised more than $330,000 for cancer research. Plus you can nominate a girl you believe makes a difference by filling out a form and mailing it in. If the story is picked Our Generation will send her some amazing gifts! Holly is so detailed, it is really amazing the quality of doll she is. Her body is soft with plastic legs, arms, neck and head. She is able to sit, stand on her own, she can do the splits, raise her arms and turn her head. Holly reminds me of the kind of girls you expect to find in California, tanned, blonde and pretty with a fun personality. Just look at that outfit too! I am really happy with the quality of the clothing she came with. The dress is so pretty with tons of cute details, the boots are so soft and fluffy and even the tights as well made. Speaking of fashion, I love the wooden wardrobe. It is pretty much any girls dream come true. I think I would have died for this when I was a little girl. When the package came I actually hid it from Keira and waited ever so patiently for her to go to bed so I could set it up. Somehow I lost about an hour of my life just playing around with Holly and her wardrobe. I had to make up for not having this during my own childhood. It does come preassembled which is awesome for parents with girls who cannot wait to start playing. The warddrobe opens with ribbon pulls tied onto the hardware which is kind of pretty. It also comes with 5 extra hangers. The wooden wardrobe comes with five shelves, a bench with drawer, a rod for hangers and even a little vanity plus a pretty little matching ottoman stool. 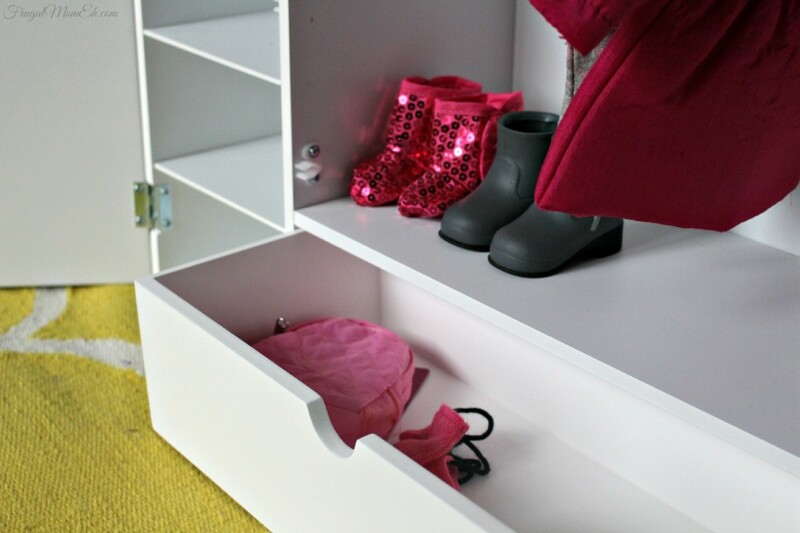 There is literally a place for everything in the wooden wardrobe, which makes it a bit of a must have for any girl intending to build a complete wardrobe for their doll. 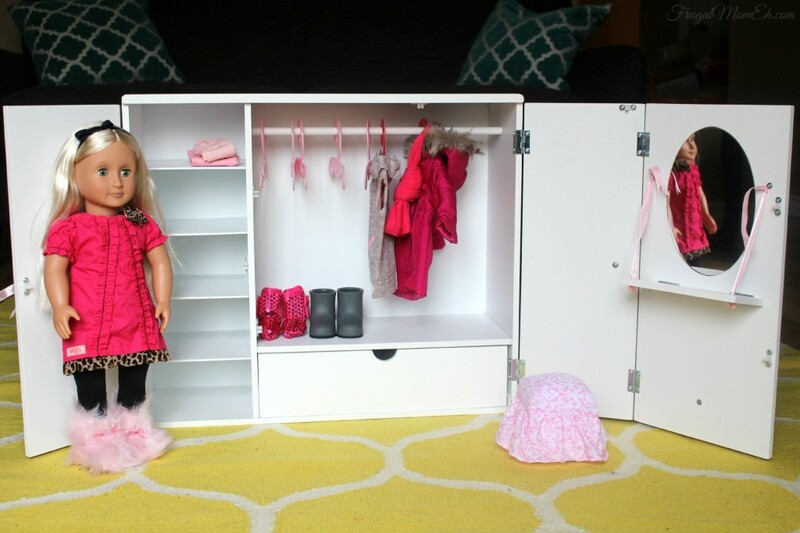 What better way to store and organize doll clothes than with a beautiful and well built wardrobe. Seriously guys, I am in love with this. Holly is quite easy to undress, although really I could probably say the same thing about trying to dress a wet cat compared to dressing my children. Keira and Ava are just so co-operative when it comes to getting dressed. I know you know exactly what I mean. I don’t even know how such tiny people are able to flip and twist around so quickly. This is the Hearts to You Fashion Set which includes a gray turtle neck tunic with sparkly bow, a pair of pink leggings with gray hearts, a pink backpack, and a pair of gray boots. It’s a sweet little outfit that is both stylish and comfortable looking – perfect for at home or school. Since Winter definitely seems to be here already Holly is in need of her furt trimmed hot pink winter coat to keep warm. 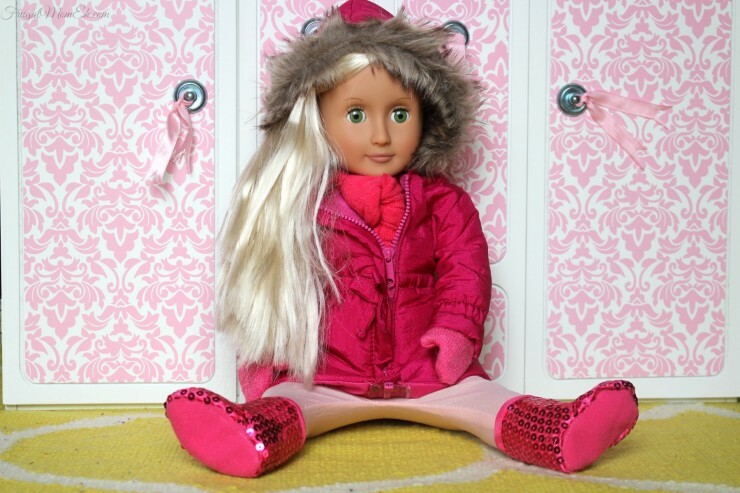 The coat is part of the Turn on the Brrrights fashion set which also comes with a pair of mittens on a string, a scarf with pockets, a pair of light pink tights, and a fabulous pair of pink glitter boots. I am so impressed with not just the quality of the Our Generation fashions but also with the fact that these outfits are so on point and stylish. There is also such a wide variety available there is definitely outfits available to suit the fashion tastes of most little girls. So what did Keira think? When she came downstairs that morning and saw Holly and the wardrobe I thought she was going to pass out, she was so excited! I honestly wish I had thought to record that first meeting, especially now that Keira seems pretty inseparable from Holly. Indeed, as soon as I helped Keira get Holly dressed in her coat Keira couldn’t wait to get dressed like Holly in her own somewhat similar winter outfit including a fur trimmed green coat and black sparkly boots. Overall I am really impressed with the collection, especially considering how affordable they have been made in an effort to be accessible to girls who may otherwise never get such a beautiful doll or accessories. Our Generation is available at Target in Canada with Dolls starting at $24.99, fashion sets at 14.99, deluxe fashion sets at 19.99 and the wooden wardrobe is available for only $59.99! These are cute dolls and affordably priced. Keira looks happy with her doll. Oh Knitted clothes would be amazing! That makes me wish I knew how, or had the time to learn. omg what an adorable doll. so life like and the cute little clothes for them!! What a cute doll. 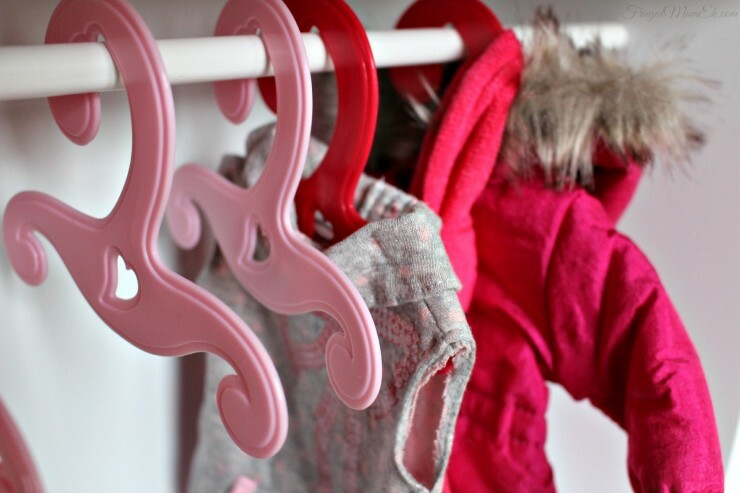 I love that she comes with her own wardrobe – literally! That generation doll is so cute! What a great alternative to Barbies – these are super sweet. That is the cutest doll ever. I love all of the little accessories, every little girls dream. My daughter would love this. The doll, the wardrobe and the clothes are all so cute. My daughter would love this. the accessories and clothing are so cute. Love the case that houses everything. Oh wow this doll has plenty of clothes to wear. It’s actually quite fun dressing up a doll, especially when one is a fashion designer. 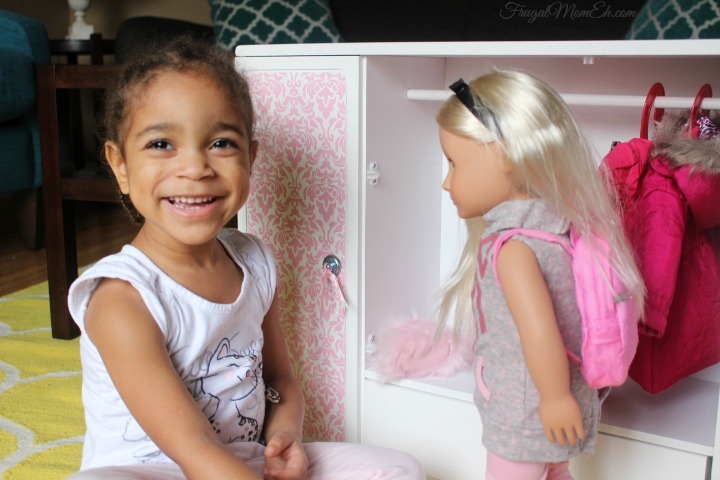 Wow, that doll has a better clothing storage system than me! My girls love these dolls too. looovely! no wonder why little girls would be inseparable to Holly! I was never really one to play with dolls growing up, but this looks like a cute set! I love the fluffy boots. 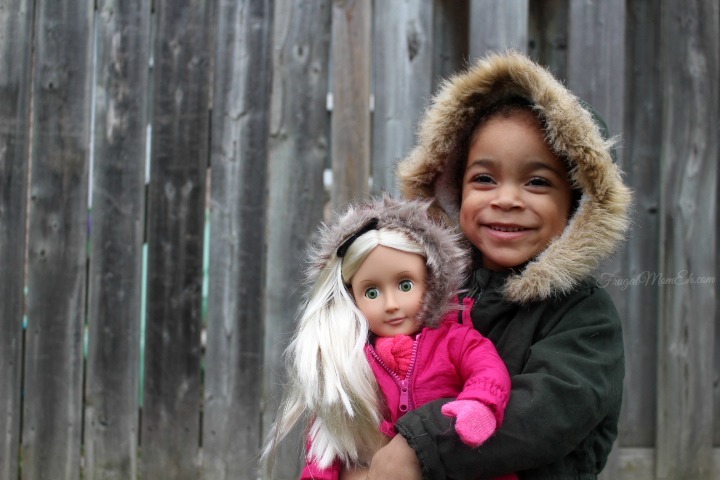 Such a cute lil’ girl you have and the doll is adorable also! 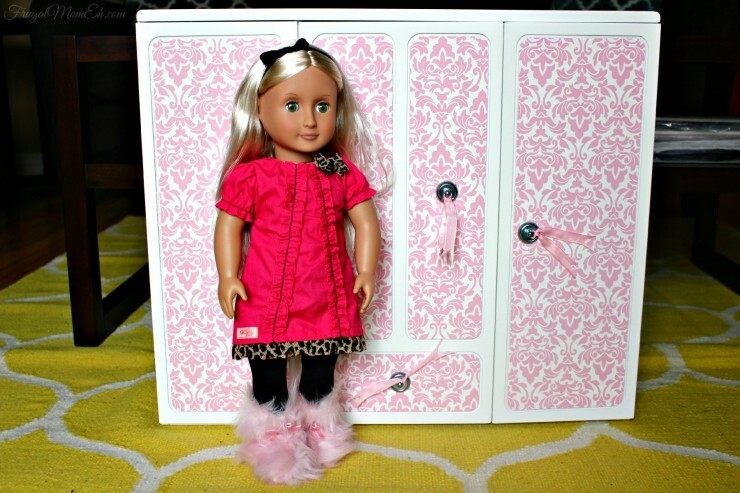 This would be awesome for any lil’ girl who loves her dollies! OMG that doll is so big and realistic. lol. I used to play only with small barbies way back lol. Lovely Holly’s gonna be a perfect gift! My niece would love it! Omg, that is so cute! My daughter would go crazy for this. Perfect Christmas gift. Such a cute doll, any little girl would be so happy to get one! Such a beautiful doll! I’m sure any little girl would love this! Cute doll. I wish I had a wardrobe for my dolls when I was younger. I love this doll! My granddaughter is only 3 weeks old but I’m already dying to start buying things like this. This is such a cute doll. I love all the accessories you can get for her. This would be a great Christmas gift. My daughter would have loved this doll when she was younger. I love the wardrobe and all the clothes you can get for her. Great Christmas gift idea. This would be a great doll for kids. It looks so cute and I’m sure kids would love them. I know a few little girls that would love this for Christmas! Her pink sparkly shoes are just amazing. What a fun find! My daughter would absolutely love this doll! She has so many cute clothes! These dolls are awesome and adorable along with the outfits. It would make a great gift for my lil niece. Thanks for sharing. I thought the doll holly was so cute up until I saw your daughter then I said okay that’s the real doll here! The quality of those dolls looks amazing! My daughter is not old enough to play with this yet. I do however really think it is cute and my niece would love it. This is such a cute doll, I Love that she has her own closet and clothing. How sweet. I wish my daughter was still into dolls, although she semi is .. I bet this one she may like a lot! 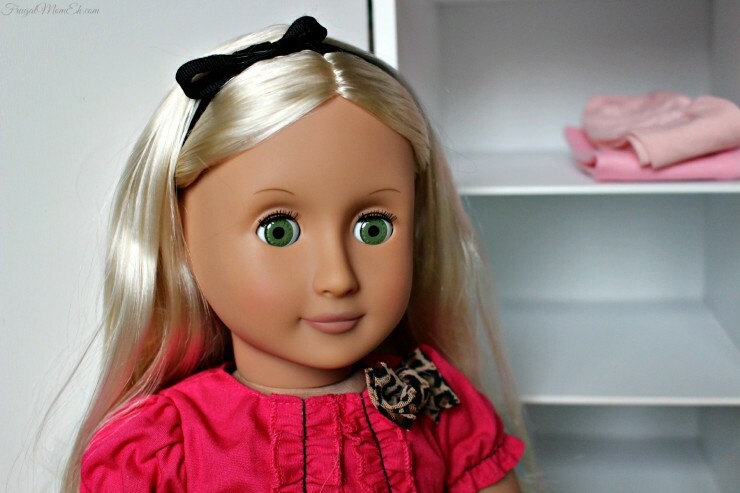 I just bought one of these dolls for my niece for Christmas, my daughter received 2 last year and loved them! They are fashionable and reasonably priced, great gift! What an adorable doll! I really love how the face looks so life-like. & the clothes, love her style! Those dolls look so realistic & beautiful. I can’t help but think my baby girl would love this. She’s really all about her baby dolls these days. These dolls are beautiful and so realistic looking.